On Monday, January 29, 2018 the House Intelligence Committee voted along party lines, with all Democrats voting against and all Republicans voting for, the release to the general public of the much-talked about classified FISA abuse memo, which reportedly details abuses that reach up to the highest levels of the FBI and DOJ, where select members used an unverified document as a basis to spy on Trump campaign members before and after the 2016 presidential campaign for political purposes. The controversial memo created by the House Intelligence Committee Republicans and staff, was voted on by the Committee, first to be shown to the full 435 House members, who after viewing the classified document from a secure facility demanded a vote to declassify it and show it to the public in a #ReleaseTheMemo campaign. Immediately after the Committee voted, along party lines, to release the four-page memo to the public, it was delivered to the White House. The President now has five days to decide if he wants it released. If the president agrees to have it released to the public, it will be. If the president says no, then it goes back to the House of Representatives who can then decide to take a vote in the House to override the president's decision. By all accounts, the president is leaning towards the path of "full transparency," as stated by White House Press Secretary Sarah Huckabee-Sanders, in favor of releasing the memo to the public. He is expected to make his decision public after his State Of The Union address, which will be given on Tuesday, January 30, 2018, although there is a campaign by some encouraging him to release it during the SOTU or to at least to give official approval for the release to the Speaker of the House. As ANP reported on Monday, FBI Director Christopher Wray visited the Capitol on Sunday to view the FISA abuse memo, and by Monday morning, FBI Deputy Director Andrew McCabe was put on "terminal leave," where he would stay on FBI payroll, but would no longer be performing any duties, and he reportedly did not even show up for the Monday morning meeting. This suggests the information Wray saw in the memo pushed him to relieve McCabe of duty more than a month before he was slated to leave the agency. According to multiple reports and sources, McCabe, Deputy Attorney General Rod Rosenstein and former FBI Director James Comey, are all mentioned in the FISA abuse memo. Rosenstein is the only one of those three names that still holds his position.... for now. The newest development in regards to McCabe was revealed by Tucker Carlson on Monday evening, where he told his viewers "Andrew McCabe is indeed mentioned in the memo, a number of our sources confirmed that to us. Is that the reason he left his job today? We couldn’t get a definitive answer on that. It seems the memo likely played some part in his leaving, but in the course of our reporting we learned something else, from the source. McCabe is the subject of at least one internal DOJ investigation, maybe more than one. DOJ inspector general Michael Horowitz has been investigating politically motivated behavior at the bureau during the 2016 election. One source told us that McCabe’s resignation is likely tied to Horowitz’s work. Other updates come to us via Sean Hannity, who was joined by Judge Jeanine Pirro, former deputy assistant to US President Donald Trump, Sebastien Gorka, and Sara Carter who has been ahead of the MSM in her reporting, when she broke the bombshell news that Obama administration officials were "unmasking" Americans' names at an increased rate before Obama left office, specifically targeting Trump campaign team members, for political reasons. Carter states she has been told "by a number of sources" that there are indicators that McCabe may have asked FBI agents below him, to "change their 302's." A 302 is the form agents fill out after conducting interviews with witnesses or suspects. Meaning that after their interviews, they would fill out their 302 forms detailing the information the obtained from their interview, and McCabe was having them alter their interview details. Carter maintains this is just one of the issues the DOJ Inspector General is investigating in regards to McCabe, and that if this is true and not just alleged, McCabe will be "fired" outright. Her sources tell her there are discussion about firing him within the next few days. Gorka reminds viewers that it was the FBI itself that destroyed the laptops associated with the FBI investigation into Hillary Clinton's use of a private server, while using the unsecured server to transmit classified information. Gorka then asks "Who gave that order?" Hannity then goes to Judge Jeanine for the legal analysis, where she begins by saying "What we are seeing here Sean, is what we would expect to see in a third world country, where a political party is using their justice system to not only surveil individuals, but to change the course of a presidential election." The video clip of Hannity, Judge Jeanine, Gorka and Carter is embedded below, but the good Judge Pirro segues us right into the "manic panic" being seen across the airwaves across America Monday night into Tuesday, with certain mainstream media personalities appearing to backtrack a bit, like rats jumping off of a sinking "Russian" ship, with liberals having temper tantrums all over social media platforms. For a year the mainstream media has accused Independent Media of being "conspiracy theorists" when we asserted there were people, at the highest levels of government attempting to rig the 2016 presidential election, with the full complicity of the MSM. They claimed there was no such things as the "deep state," or a "shadow government" of individuals that used their positions of power to "control" elections and spread propaganda. That is why Democrats on the House Intelligence Committee all voted against allowing their fellow Representatives in the House to see this four-page FISA abuse memo, then attempted to prevent the committee from voting to release it to the general public. The memo is purportedly bullet points taken from classified documents which shows top level FBI agents, that actively participated in the Clinton investigation, and took actions to change the course of that investigation in order to exonerate Hillary Clinton of crimes, to help get her elected and to prevent Donald Trump from winning the 2016 presidential election. When that failed, those agents created an "insurance policy," using a Kremlin sourced, unverified dossier, which was funded by Hillary Clinton and the DNC, to obtain FISA warrants to surveil Trump campaign members, in an attempted coup to overthrow a duly elected president. Democrats and the media spent over a year pushing that "Russia collusion" and Russia meddled in the election" themes, and now, finally, if President Trump approves the release of the FISA abuse memo, Americans will have the ability to see for themselves that it wasn't the Russians that were a direct threat to the democratic process of electing a President, but top level members of the FBI and DOJ actively engaged in a conspiracy, in other words "colluded," to meddle, and then used fake evidence (the Steele dossier) to manufacture a narrative and investigation meant to discredit a sitting president. The reason they are now alternating between "manic and panic," as American Mirror puts it, on public televisions in order to "spin" the information the public should soon have access to, is because every single talking point they have spent a year pushing to the public...... is about to go up in smoke. The perfect example of this is shown in the clip below, where CNN brings on House minority leader Nancy Pelosi, where her utter panic is clear, as she stumbles and bumbles through her incoherent answers. The clip is interesting in another way as well, as we see CNN's Chris Cuomo, apparently arguing for the release of the memo. My guess is that certain media personalities, like Cuomo, who have been pushing the "Russia" narrative onto their viewers for over a year, are attempting to distance and disassociate themselves from a narrative that is blowing up in all of their faces in order to maintain whatever amount of credibility they think they have left. Watch Pelosi and Cuomo clash, where at one point she snaps at him after he points out that FBI Director Christopher Wray saw the memo and did not come out saying it would be reckless to releae it, and Pelosi angrily says "With all due respect, you really don't know what you are talking about." (That occurs around the 6:10 minute mark. Directly after the House Intelligence Committee vote, Rep. Adam Schiff came out to speak to reporters where he made a number of claims, one of which is the same one heard above by Nancy Pelosi, stating that the Republicans voted to release their memo, but won't allow the Democratic counter-memo to be released, implying that the Republicans only want their memo released. Misleading Assertion: She is right, the Republican did vote against the immediate release of the newly created Democratic memo, but what she misleads the public on is that the four-page memo that was just voted on to be released, first was voted on back in mid-January to allow the full House to have access to it, with every Democrat voting against it. Then after House members were offered access and demanded it be declassified and released to the public, they held Monday's vote to authorize release to the public. The Democrats on the House intelligence Committee tried to demand the release of their memo without any of the other House members being given the opportunity to even see it. 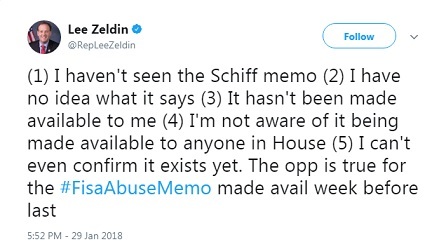 Representative Lee Zeldin made that point Monday night on Twitter, stating "(1) I haven't seen the Schiff memo (2) I have no idea what it says (3) It hasn't been made available to me (4) I'm not aware of it being made available to anyone in House (5) I can't even confirm it exists yet. The opp is true for the #FisaAbuseMemo made avail week before last." Rep. Zeldin is correct that the Democratic memo had not been released to the full house, yet. What Pelosi refused to reveal is that the House Intelligence Committee did vote to allow the full House to view the Democratic memo, it just hadn't been made available at the time of his tweet, and even Adam Schiff, stated "I made a couple motions this afternoon, or this evening. First, we scheduled a hearing today, or the business meeting, so that the minority memoranda could be made available to the members of the House that have been misled by the majority's memoranda. We expected that vote to be noncontroversial, and it was. The House members will have access to the minority memoranda." Later in Schiff's news conference he details how he tried to get their memo released immediately, without giving it the same time for the full House of Representatives to access it, by offering another motion, before the House had even had a chance to even look it, by saying "Finally, I moved that if the majority were going to release their memoranda publicly, that they release the minority views as well, that they be released jointly. And the majority on a party-line basis voted against both memoranda being released to the public." Apparently Democrats do not think they should have to follow the same procedures that Republicans did and expect to be treated differently. It is worth noting there are 13 Republican members on the House Intel Committee and 9 Democrats, so if the Republicans were trying to "hide" the Democratic memo as Pelosi attempted to claim to Cuomo, they wouldn't have voted to make it available to the full House membership. Another interesting attempt to mislead by Pelosi came where she informed Cuomo he didn't know what he was talking about when he mentioned that FBI Director Christopher Wray saw the memo and did not come out saying it would be reckless to release it, when he followed up with the direct question (which he already knew the answer to) asking Pelosi "Did Christopher Wray look at it, or no?" Her response was "I can't say whether he did or not....."
By the time of Pelosi's interview with CNN it was already well known and heavily reported that Wray went to the Capitol on Sunday to see the memo. Pelosi also claims that the memo is an attempt to "distract" from the Russia investigation, which makes one wonder if she even read the four-page memo at all, or whether she had "forgotten," that the memo reportedly details actions taken by high level FBI and DOJ officials to manufacture a Russia/Trump collusion investigation to begin with! To date, not one shred of evidence has been found supporting the "collusion" between Russia and Trump campaign team members to meddle in the 2016 presidential election. Multiple Russia investigations are ongoing in both the House and the Senate, the DOJ, and the FBI have spent over a year investigating, and a special counsel investigation that has lasted months, and has only managed to charge four people on process crimes unrelated to the 2016 presidential election. I assert that Nancy Pelosi, Adam Schiff are the ones trying to distract from the upcoming evidence that may be released to the public, in an attempt to cover up their own misdeeds and the corruption within the DOJ and FBI. Millions of Americans want to see the FISA abuse memo, the House Intel Committee has already approved its release, the President has it in hand. Democrats are whining and spinning in "manic panic" on every news outlet they can get onto and now. 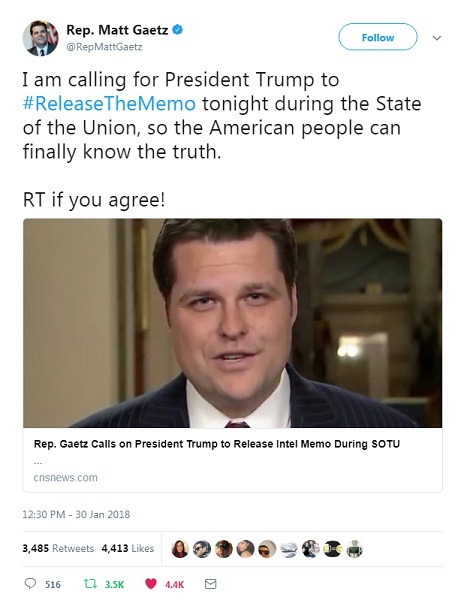 We are now seeing on almost every social media platform, in comment sections and chat forums, people urging president Trump to #ReleaseTheMemo during the State Of The Union address....... this includes one of the most outspoken proponents for the release of the memo to the public, Florida Rep. Matt Gaetz, who says "I am calling for President Trump to #ReleaseTheMemo tonight during the State of the Union, so the American people can finally know the truth."